Qualified Postnatal Carer/ Maternity Nanny trained with NEST. Available for ad-hoc , temporary night , day maternity/nurse/nanny , short term ,live in, or live out, emergency positions from February . 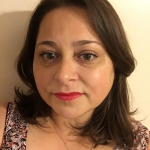 Hi, I am Valentina and love to look after newborns ,infants ,young children 0-3 years old .Happy to help with light housekeeping or other children ,of course time permitting . As a person I'd say I am mature ,positive,trustworthy ,happy , warm and loving nature ,and have excellent time keeping. I am very flexible and happy to meet your family needs. I have a natural ability to bond with babies and young children easily and enjoy helping them reach their developmental milestones. Hold a EU passport and have the right to work in UK . I do not hold a driving license. I have over 11 years experience with children 0- 5 years old , 8 of them working as private Nanny . March 2018- January 2019 temporary part time Maternity nanny for a 1 .2 year old toddler and 64 weeks old baby . Feel free to contact me with any further questions you may have . Below are the latest reviews for Val. Please note that reviews represent the subjective opinions of other Childcare.co.uk users and not of Childcare.co.uk. Parents must carry out their own checks and references on childcare providers to ensure that they are completely happy before enaging in the use of their services. We are very sorry indeed to be losing Val. She has worked as our nanny for fifteen months and she has been completely reliable throughout: a rock for our family. We have no hesitation in recommending Val to look after your children; our little boy adores her. Val is a hard worker, always punctual, efficient, cheerful and easy to work with. She is leaving us to work with newborns and we wish her all the very best. really helped us out short notice!